The weather hasn't been very summery here for the last two weeks, and it has me craving autumn foods like pumpkin and kale. This salad has a great bite and is packed with nutrients like calcium, iron and vitamins A and K.
As with all cruciferous veggies, it's nice to let the salad sit for a while so the dressing has time to soften up the kale. If you mix it up in the morning and take it to work, it will be nice and tender by lunchtime. In the picture I added some extra tofu feta to the salad. It would also be really good with these smoky tempeh cubes or some nut cheese (for a paleo option). Put the kale in a salad bowl and mix in the oil, vinegar, mustard, sweetener and salt. 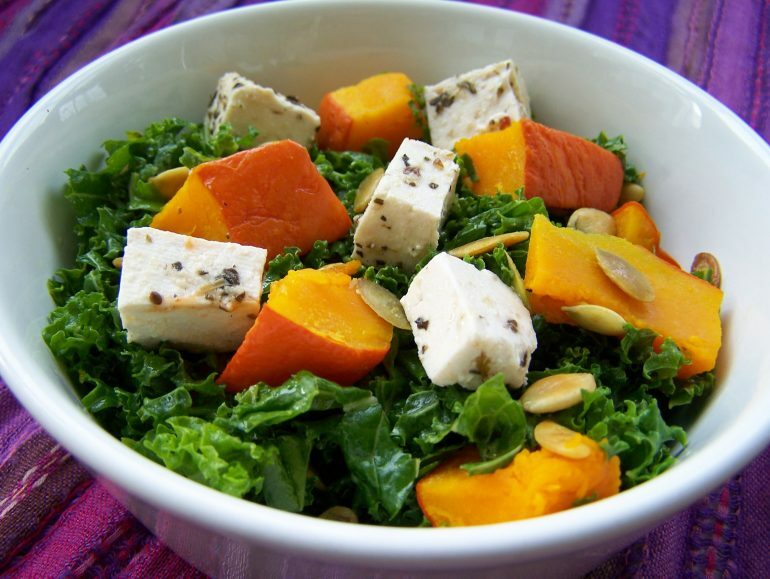 Knead the kale a bit with your hands or crush it with a fork until every piece has some dressing on it. If you want to soften it up faster by really 'massaging' it, but you can also just let it sit for a while until it gets tender. While the kale is getting tender you can prepare the other ingredients. Cut the pumpkin into cubes (peeling not neccesary!) and cook them in the microwave or in a steamer pot. Roast the pumpkin seeds in a dry pan. If you want, you can also make the tofu feta or smoky tempeh now. Add everything to the salad and enjoy!